Jazz up standard baked beans with a crunchy rye bread crumb topping. These beans are perfect with anything from the grill, like hot dogs, burgers, and ribs. If you’re not a fan of rye bread, substitute hearty white or whole wheat, just be sure to butter the slices for extra flavor. Cook bacon in a skillet until crisp; transfer to a paper-towel-lined plate. Pour off all but 1 Tbsp. drippings. Sweat onions in drippings until soft, 5 minutes. Stir beans, tomatoes, brown sugar, ketchup, mustard, Worcestershire, Tabasco, and bacon into skillet; season with salt. 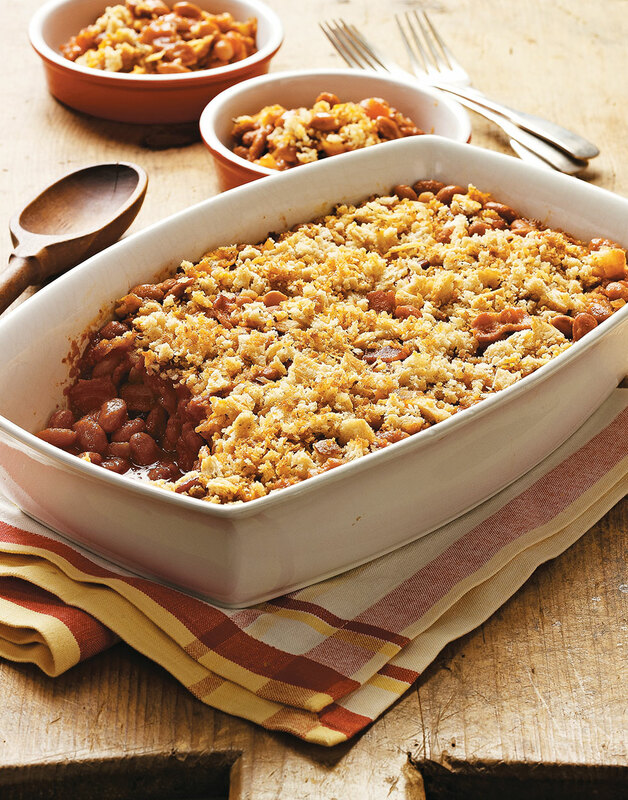 Transfer beans to a baking dish, top with bread crumbs, and bake until bubbly, about 20 minutes.